Infographics are the newest trend. With the internet overflowing with information and complex ideas, infographics help to visualize knowledge in a compact and clear way. Additionally, infographics are easy to implement in various different media: on social media channels such as Facebook or Pinterest or in blog articles to underline certain factoids. Since Infographics can offer complex knowledge in one concise graphic, they are perfectly adequate to illustrate business content from various areas such as marketing, sales, consulting, HR and e-Commerce. Especially in PowerPoint presentations you may need to highlight numbers, percentages, comparisons, balance sheets or distribution analyses without using a lot of text. Since working with too much text in PowerPoint should be avoided in general, infographics are the perfect solution: they transfer the information visually attractively and in a compact format. Is your product mainly being used by men? Have your sales gone up in the past couple of months? Highlight achievements, balance sheets, analyses with trendy Infographics and make complex or mundane topics more interesting and easy on the eye! 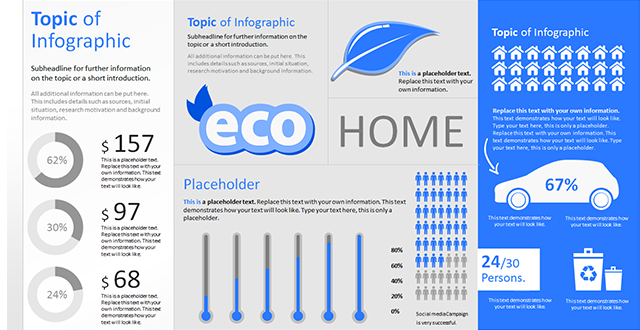 Find matching Infographics for your subjects by browsing the PresentationLoad online shop – here we have a wide variety of graphics on topics such as ecology, marketing, finances, social media, sales, customer analysis, technic, IT, management, employee distribution and target group analysis. All our PowerPoint templates are available as direct downloads and can be used directly after the purchase. Save time and trouble and present a top presentation with new and interesting highlights!